Our directory has 221 Krispy Kreme Doughnuts locations. There is nothing better than getting off the metro and walking straight into sugar heaven. 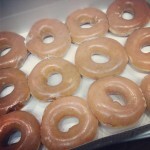 I recommend (especially during the cold winter days) a cup of coffee and an original glazed donut. AMAZING. The Ghirardelli Sea Salt Caramel Doughnuts are the best here, among others. Yum and delish! They go extra mile to satisfy customer. Quick service and friendly. 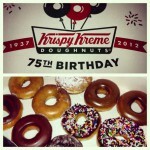 Great doughnuts! Nice caramel latte!